Congratulations! You are completely normal. At least when it comes to eating bugs. Over eighty percent of the world's population routinely does it, and so do you. And with forty tonnes of insects to every human on the planet and over two thousand edible insect varieties available, ranging in flavour profile from pistachio to green tomato to 'bacon flavoured mushroom', why the heck wouldn't you? “Woah, woah, back it up here a minute”, I can almost hear you saying. “I don't eat bugs. That's gross”. Well, I hate to break it to you, but in a food system as thoroughly centralized and industrialized as ours, you have little choice. Rice with lunch? The Canadian Food Inspection Agency allows for 25 insect fragments per 100 grams of rice. Ten maggots per 100 grams of mushrooms also gets a pass, and there are CFIA measurements to determine how many dead mites are okay in our cheese (live mites are never allowed). The US is no different, with up to 30 insect fragments per 100 grams allowed in peanut butter and twice that for chocolate. Scarfed spaghetti on a trip stateside? Up to ten fly eggs or two whole maggots may have hitched a ride in every 500 grams of crushed tomatoes used for sauce. So you're eating bugs already, and I'm about to tell you why this is a good thing. Crickets, chilies and spices about to be ground up for cricket guacamole. First, they are the most sustainable protein that exists. The fact that they stack up well compared to traditional livestock will be no surprise as awareness grows about the land, water and grain waste factory farming incurs, and the greenhouse gases it produces. Ten pounds of grain feed will give you one pound of beef at the other end, compared to six pounds of cricket. One hundred gallons of water will be needed for six grams of beef protein, with crickets seventy-one grams of protein is produced. Exothermic, their bodies do not need artificially heated spaces so farming requires virtually no fossil fuel energy. It's now known that insects outperform alternative protein crop soy, as well as staple crops corn and rice, for water efficiency as well. Of equal importance, the large amounts of iron they contain make them important in the fight against malnutrition. Iron deficiency/anemia is one of the most common nutritional problems in the developing world. Untreated, anemia can cause heart failure, premature birth, and delayed growth and development. Crickets contain almost as much iron as a traditional beef burger patty, buffalo worms best it. Bug iron is as or more bio-available than the heme iron of red meat and is better absorbed than less bio-available, non-heme iron from spinach or legumes. Three alternative protein sources. Nuts, legumes and larvae. Bugs will eat just about anything, raising them is cheap or free and uses very little space, and as the world's population grows they appear an attractive future food source to feed the possibly eleven billion people predicted by centuries end. Critics fear they may wind up just another trendy, expensive niche food with very little impact on global food supply. But the UN sees them as a potential game-changer, as do various chefs, food traditionalists (people have eaten bugs in many cultures for a long, long time) and environmentalists. A branch of veganism known as entoveganism has developed to embrace their benefits, as many believe bugs experience less pain than other creatures do if any at all. Entomophagy is the wider term for bug consumption. 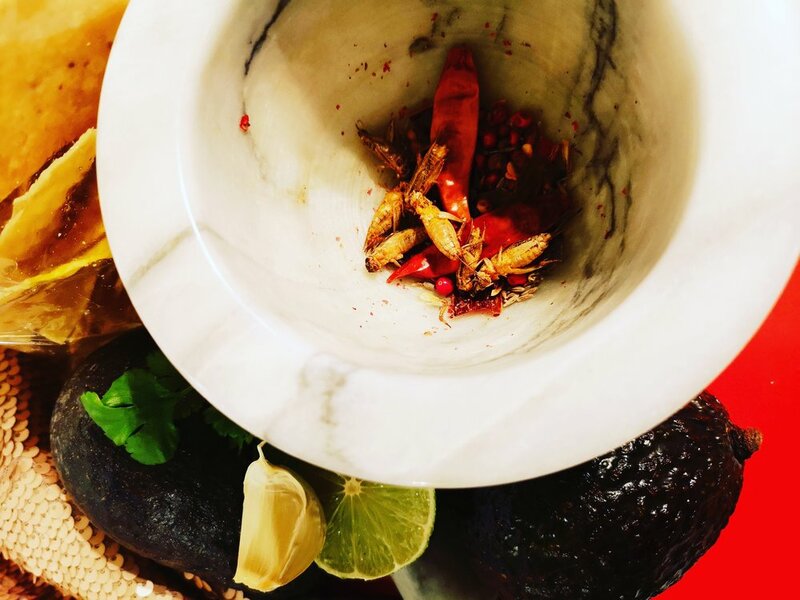 In its gourmet form, world-class sustainable restaurants like Copenhagen's NOMA are serving up insects not just at their own place but at such catering gigs as a 2018 Justin Timberlake album listening party the star held in Manhattan. Nicole Kidman encourages entomophagy too. Closer to home, grilled black ants dusted over fresh scallops and sourdough bread are sometimes on offer at Grates Cove Studio. The ants have formic acid in their stomach, which makes them taste like zingy lime pickles. Definitely less intimidating than such global delicacies as fist-sized deep-fried water beetles and medicinal giant wasp moonshine. Let's just start with the ants. Crickets can also be enjoyed as crunchy snack as used here on this snack plate.